Plot synopsis: A woman reads her fiancé's diary to find out why he suffered the unfortunate fate that he did, and discovers an account that reveals a shocking descent into madness. Review: At the start of this episode, I did not have high hopes for it, and with the bulk of it presented in the form of rambling diary entries, there was a real danger of it becoming quite monotonous. 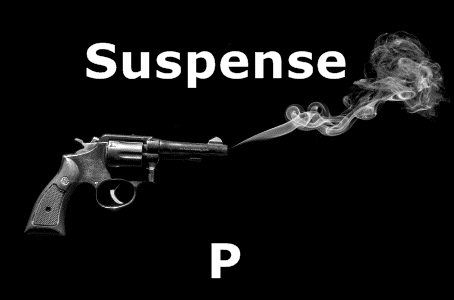 However, before long, the narrative works its way into the listener's head, and becomes one of Suspense's most memorable exercises in weirdness. Most notable is how the main character's diary reveals that he came to believe that the different parts of his body were able to detach themselves and wander off independently! The whole is also shrouded in a strange, dislocated atmosphere that after a while becomes chillingly unnerving. If there's a weakness in terms of the plot it is that, despite the diarist writing feverishly about meaning to kill his fiancée, the listener knows from the outset that she does not die, as she is the one reading the diary. Yet the episode is not really about plot, but about presenting a portrait of a mind in the process of falling apart, and in this, it succeeds very well. Plot synopsis: An American forger on the run from the authorities gets mixed up in the Spanish Civil War. Review: What a strange, contrived story! The title refers to a method of teaching penmanship, which is important to the episode's plot, but its main mechanics centre on a series of highly implausible events. To begin with, we are asked to believe not only that the main character is so insensible of world affairs that he has no idea about the seriousness of the conflict going on in the Spanish Civil War, but that he takes absolutely no trouble to find out about it before deciding to sign up to fight on the side of the Republicans! Then, once he has arrived in Spain, the improbabilities keep piling up. Most notable - SPOILER ALERT! - the protagonist ends up adopting the identity of a man he kills, an undercover bomb specialist, in order to defraud money from a group he believes is working for the anti-fascists. The issue here is that although, yes, the contact he meets doesn't know what the man he is impersonating looks like, whereas the latter is upper-class and British, our hero is a wise-talking New Yorker who makes no attempt to disguise the fact - surely, the woman he attempts to fool would at least know what nationality he is supposed to be? Yet despite all this, it's a fun episode, with Ed Gardner (a well-known comic actor of his day) doing some good work in the main role, and a satisfying - if not entirely unpredictable - twist ending. Plot synopsis: A recently released convict is tracked down by members of his former gang, against whom he had testified to the authorities. Review: After a slow beginning, this episode develops into a tense affair, with a strong second act that offers some definite thrills. In particular, there's a real question mark over whether or not the main character will even survive. There are fine performances, too, from the two leads. It's disappointing, therefore, that the conclusion is decidedly weak and extremely anticlimactic. Without giving away how the episode ends, it relies on what amounts to little more than a deus ex machina, with the protagonist left essentially passive. Still, with a better, more imaginative resolution, it is easy to imagine the story working well as a film. Plot synopsis: An American psychologist investigates the strange circumstances surrounding the killing of a young woman in a Hindu temple on the island of Trinidad. Based on a short story by T. S. Stribling, first published in Adventure magazine, on 20 February 1926; and later in his short-story collection Clues of the Caribbees, in 1929.
Review: The hero of this episode, Dr. Henry Poggioli, appeared in a number of works by the author of the story from which it was adapted, T. S. Stribling. The writer apparently created the character with the deliberate intention of having him stand in contrast to celebrated fictional detectives like Sherlock Holmes, in that he is far from an infallible 'genius' (what may also be of interest is that another detective who features in a Suspense episode, Trent's Last Case, was created for a similar reason). Thus, Poggioli does not prove himself to be a very capable investigator, and makes some very questionable decisions. This, though, is necessary for the episode to be able to culminate in the ending that it does, which delivers a good surprise twist that few will anticipate. However, a major issue for many modern listeners will be that the episode is also quite dated in various respects. The story was written at a time when Trinidad was a British colony - as it still was when this Suspense episode was produced - and the script plainly reflects the colonial attitudes of the era, especially in its highly patronizing and disparaging (perhaps even racist) references to the natives as 'coolies'. It clearly, therefore, adopts a white, Western perspective, which treats Trinidadian culture as alien and mysterious, and less than fully civilized. Even so, the story is a strong one, with an ending that is effective and memorable. Plot synopsis: A man murders his twin, allowing him to steal his brother's identity, but after chopping up the body, finds that disposing of the head is no easy matter. Review: The major plus point of this episode is the fact that, since Joseph Cotten voices both of the story's twins, the audience gets more than its money's worth in terms of Cotten's dual performances. The basic idea is also intriguing: can a twin successfully pass himself off as his sibling? However, there are various issues that let the episode down. One of these is that the script is no more than adequate, with little in the way of scintillating dialogue. Another is that, at times, the over-ripeness of the central conceit leads the story dangerously close to collapsing under the weight of its own absurdity, especially as we follow Cotten's character (the murderer twin, that is) in his increasingly desperate attempt to dispose of his brother's decapitated head. Yet as Cotten tries various ways to rid himself of the troublesome body part, this starts to become a little tiresome - not to mention lacking in plausibity. For example, his attempts to do so include - SPOILER ALERT! - trying to swap the box in which he has placed the head with a customer's box in a department store. This is so obviously a terrible idea, it's difficult to believe that the writer could not think of anything better - why not try something as simple as burying it, say? Still, the twist at the end, though pretty predictable by the time it arrives, is not bad. Moreover, two Joseph Cotten performances for the price of one is always going to be a good deal. Plot synopsis: A man is asked by his fiancée to recover a string of pearls stolen from the old woman whom she works for as a nurse. Based on a short story by Raymond Chandler, first published in Dime Detective magazine, in April 1939; and later in his short-story collection The Simple Art of Murder, in 1950.
Review: For fans of Raymond Chandler (and if you are listening to Suspense, how can you not be? ), this episode is a real treat. Indeed, you may find yourself grinning from start to finish. This is quite a faithful adaptation of the original short story, and it is an unusual one for Chandler in that it is a parody rather than a straight drama. Specifically, it is a spoof of bad detective fiction, but whereas most such offerings tend to be trite and unimaginative - simply presenting over-ripe dialogue in mimicry of the hardboiled style - because this is Chandler, it's the real deal: the dialogue zings, the plot provides exactly the kind of convoluted yet involving storyline one expects, and it moves at a fast, exciting pace. What is also interesting is that it doesn't satirise just the hardboiled variety of crime fiction. The hero is not a tough, cynical Philip Marlowe or Sam Spade style private eye, but a well-spoken, highly educated character who - we are told - talks like Jane Austen writes! This may be a dig at the kind of characters who populate the staid British crime fiction of the era (of the likes of Agatha Christie), who tend to speak in just this artificial, mannered way. In any case, this is a very entertaining episode, which parodies the crime genre in a knowing yet affectionate fashion, and plays with its conventions without simply mocking them. Plot synopsis: Three men set out to explore Superstition Mountain in Arizona, using a copy of the 'Peralta map', to try to discover the location of the Lost Dutchman's Gold Mine. Review: There are some interesting aspects to this episode - unfortunately, they all appear to have been 'borrowed' from The Treasure of the Sierra Madre. As in the latter - both the book (1927) and film adaptation (1948) - three treasure hunters set out to make their fortune; the object of their quest is gold; the trio of characters is comprised of two younger men and one 'old-timer'; and they are undone by greed and infighting. So, there isn't much here that is especially original. What also lets the story down is that the ending is quite weak; in fact, it's somewhat unclear exactly what does happen at the very end. All in all, not much to recommend about this one - go watch the excellent, Humphrey Bogart-starring film version of The Treasure of the Sierra Madre instead.